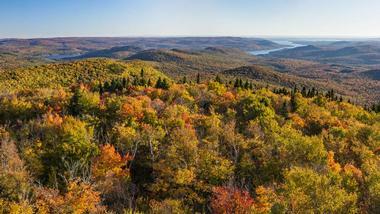 New York might conjure up images of the big city that shares its name, but the state has much more to offer than just the Big Apple. In fact, the state of New York is home to 7,600 freshwater lakes, ponds, and reservoirs, including the beautiful Finger Lakes as well as portions of two of the Great Lakes. There are plenty of opportunities for whatever activity you're interested in, whether that be swimming, boating, fishing, hiking, or relaxing on the beach. Spanning the border between Pennsylvania and New York, the Allegany State Park is home to two lakes: the Allegany Reservoir and the Kinzua Dam. The lakes are surrounded by plenty of hiking trails, some of which make it possible to explore the area's beautiful caves, and the sandy beach is perfect for swimming. Boaters can access the reservoir thanks to the Friend's Boat Launch, and two fishing piers make it possible to fish from the shore. There are 189 campsites and 230 cabins available for anyone wishing to spend the night here; 30 of the cabins are suitable for use in the winter. 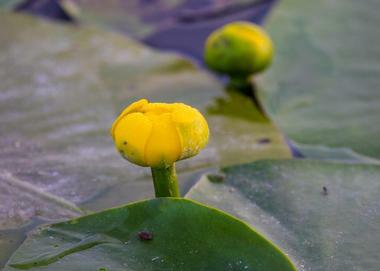 Established in 1926, Belmont Lake State Park is home to the 26-acre Belmont Lake as well as a large wetland area. The park offers many excellent picnicking locations as well as 7.6 miles of trails that can be used for hiking, horseback riding, and bicycling. Fishermen will enjoy the spring-fed lake, which brings the opportunity to fish for trout in the spring and for bass during the summer. Pedal boats, rowboats, and kayaks are available for rent for a small fee during the summer months, while kayaks and canoes may be launched from the boat dock. Situated at the head of the Moose River in upstate New York, Big Moose Lake is popular for its remote location and beautiful landscapes. There are plenty of hiking trails to be found here, including trails that lead to Russia Lake, the Sisters Lake, and the Gull Lake, where visitors can camp in the lean-tos. The bays and narrows of the lake offer scenic views to canoers and kayakers, and birdwatchers will be pleased by the many opportunities to see loons and kingfishers. There is a hard surface ramp on the south shore of the lake, and fishing is permitted during the summer. 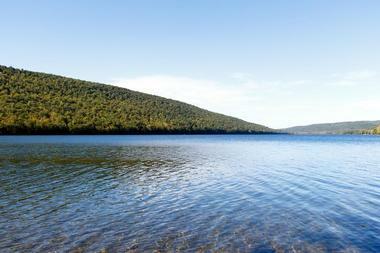 The smallest of the Finger Lakes, Canadice Lake offers visitors the chance to explore and enjoy its undeveloped shorelines. A long trail runs along the west side of the lake, allowing visitors to stroll through the peaceful second-growth forest and providing access to a number of secluded fishing spots. 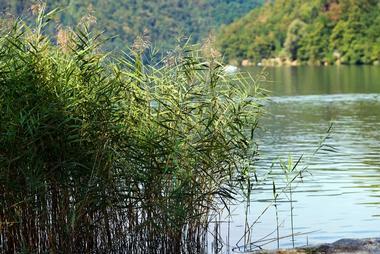 Public boat access is available on the east side of the lake, and select fish species can be fished all year round. Swimming is not permitted in the lake; pets are not allowed to swim either, but they can be brought on the trails as long as they’re on a leash. Known as the birthplace of the Seneca Nation, Canandaigua Lake is a popular fishing and boating destination with five marinas and four public access points. Another highlight of the lake includes Squaw Island, which is one of the only places in the world where special rock formations known as limestone oncolites can be found. Visitors can rent canoes, kayaks, and waterbikes to paddle out to the island and view these unique rock formations, which are known locally as "water biscuits." During the summer months, a double-decker paddlewheel boat and steamboat replica offers cruises around the lake. 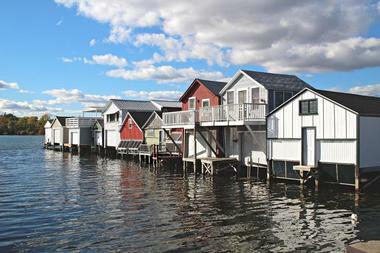 One of the highest navigable lakes in North America, Chautauqua Lake is a truly memorable summer destination. Several beautiful public swimming beaches are located along the shore, but visitors also flock to the lake to sail and fish for muskellunge. The Chautauqua Institution occupies 750 acres on the west side of the lake, and plenty of visitors come here during the summer months to take advantage of the many restaurants, stores, public lectures, and live music performances. Another attraction of the lake is the Chautauqua Belle, a replica of a 1975 sternwheeler steamboat that offers recreational cruises. 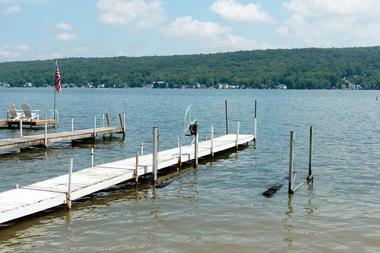 Often called the "jewel" of Livingston County, Conesus Lake is the most westerly of the Finger Lakes. During the summer, visitors come here to picnic, boat, and swim. 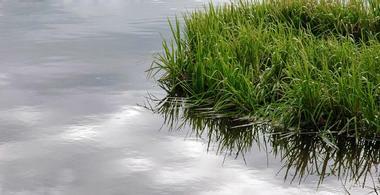 Four public access points are available, including a hard surface boat launch ramp and three cartop launch sites. The lake is also a popular winter destination; snowmobiling and ice fishing are possible when the water is frozen over, although the use of ice fishing shelters is prohibited. Several species of trout and salmon can be fished all year round, and black bass can be fished during select times of the year. Located on the west shore of Lake Champlain, Cumberland Bay State Park is a great year-round destination. The park is home to a campground with 152 campsites suitable for both tents and trailers; campers are welcome from the beginning of May until the beginning of November. Other summertime highlights of the park include a large sandy beach, picnic areas with tables and grills, a children's playground, and grassy playing fields. Many cross-country runners come to exercise in the park during the cooler weather of the fall, and winter brings the opportunity to go ice fishing on the lake. 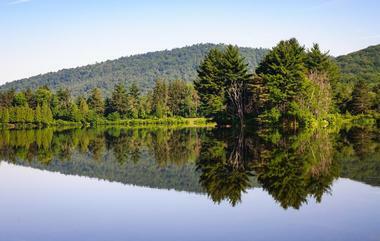 Part of the Adirondack Park, Forked Lake is part of the 740-mile Northern Forest Canoe Trail. There are two boat launches located at the east and west ends of the lake; the one in the eastern end is inside a state park that requires a day-use fee, but the one on the western end is free to use. There are 80 state-owned campgrounds around the lake, some of which can be accessed by foot or by car and others that can only be accessed by boat. 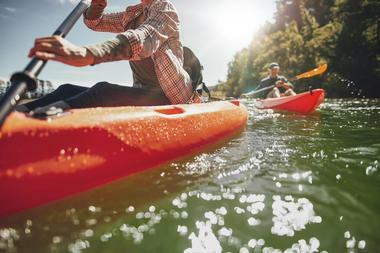 Canoe rentals are available for anyone who wants to get to a campsite or simply paddle around. Formerly known as the Sacandaga Reservoir, Great Sacandaga Lake is a man-made lake that was created by damming the Sacandaga River to control flooding in the 1920s. 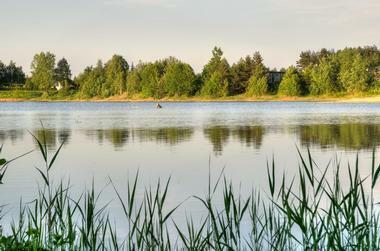 Today, the lake is a popular destination for boating, fishing, and other watersports. There are four state-owned hard surface ramp boat launches available for boaters who want to access the lake, and fish species here include several different varieties of bass, trout, and salmon. Antique shops and history museums can be found along the shore, and waterfront restaurants allow visitors to enjoy a meal while enjoying the beautiful view. 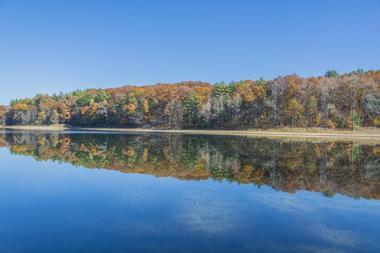 Green Lakes State Park is notable for being home to two glacial lakes: Green Lake and Round Lake. Both lakes are meromictic, meaning that there's a high probability they are home to ancient plant and animal life because the surface and bottom waters do not mix in the spring or the fall. 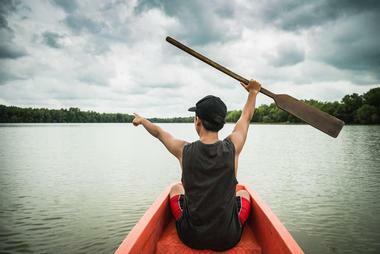 No outside boats, kayaks, or canoes are permitted on either lake because of this, but rowboats and kayaks can be rented during the summer months. The park is also home to a golf course that can be used for snowshoeing in the winter as well as 15 miles of cross-country ski trails. Straddling the border between New York and New Jersey, Greenwood Lake has been a popular tourist destination since the late 1800s. Plenty of marinas and restaurants can be found along the shoreline, and the lake also boasts a seaplane area and several large marinas. A small town named after the lake is found on the northeastern shore and offers a waterfront park with a lifeguard-supervised beach area, a volleyball court, and a children's play area. The lake itself is ideal for almost every kind of watersport, including swimming, boating, fishing, diving, jet skiing, and sailing. 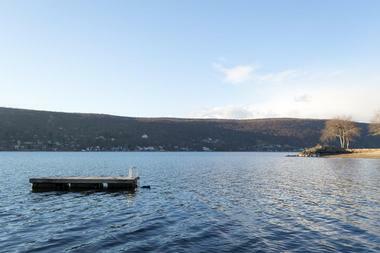 Tucked between Canadice and Canandaigua lakes, Honeoye Lake is the second smallest of the Finger Lakes. Sandy Bottom Beach Park is located on the north end of the lake in the tiny town of Richmond; it offers a sandy beach, a lifeguard-supervised swimming area, a beautiful outlet perfect for fishing, and a nature trail that winds through the marsh around the lake. There is excellent fishing to be had here, and the lake is also great for water sports like boating, tubing, and waters skiing. 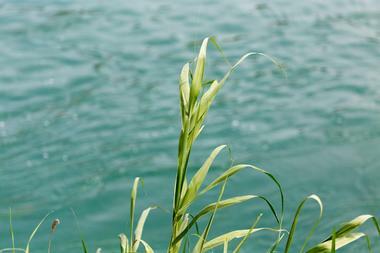 Boaters can access the lake by using the state-owned boat launch on the east end of the lake. 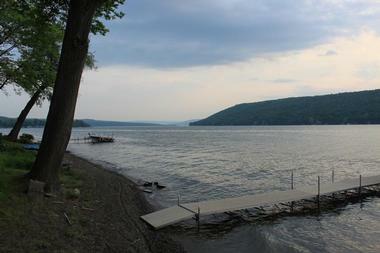 Sometimes referred to as Crooked Lake because of its unusual Y-shape, Keuka Lake is one of the most popular of the Finger Lakes. The lake is quite shallow, meaning that the water gets quite warm in the summer and is ideal for swimming and other watersports. There are plenty of marinas and boat launches along the shores of the lake, and motorboats, jet skis, and paddle boats are available for rent. The lake is also an excellent destination for wine-lovers; located right in the heart of Finger Lakes Wine Country, the area is full of rolling vineyards and award-winning wineries. 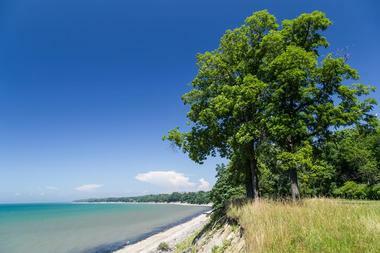 Encompassing 355 acres on the shore of one of the majestic Great Lakes, Lake Erie State Park offers magnificent scenery and year-round entertainment. The beautiful beach is one of the main attractions here, but visitors should be aware that swimming is permitted only at scheduled times. Other highlights include children's playgrounds, an 18-hole disc golf course, and hiking trails that can be used for cross-country skiing during the winter. Sheltered picnic tables are available for day use, and anyone who wants to spend the night can do so in one of the 10 cabins or 102 campsites. 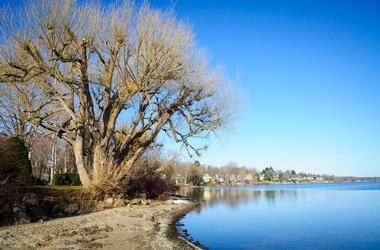 Thanks to its warm waters and beautiful surroundings, Lake Owasco has been a popular vacation spot since the 19th century. The warm, shallow water is perfect for summer activities like swimming, boating, and water skiing, and the state park on the south end boasts plenty of hiking trails and 5 beautiful waterfalls. Visitors to this park can also swim in the stream-fed swimming pool or camp in one of the 60 campsites. Emerson Park is located at the north end of the lake; it offers a swimming spot, several picnic areas, grassy fields, and a boat launch. 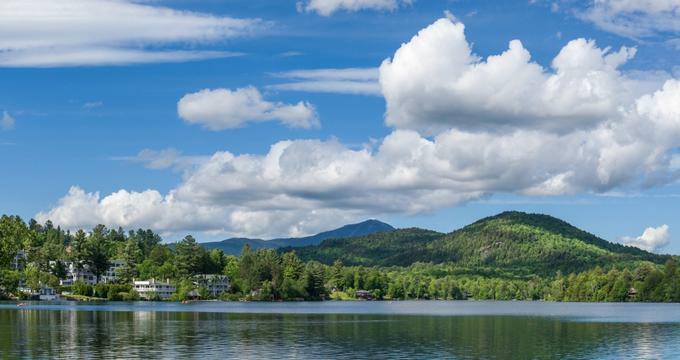 Best-known as a two-time host of the Winter Olympics, Lake Placid is a charming alpine village nestled in the Adirondack Mountains. 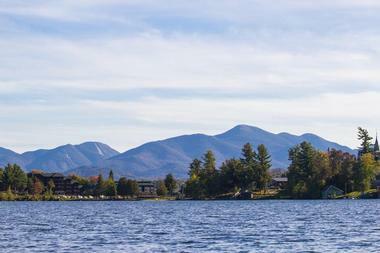 The town is located right at the southern tip of Lake Placid itself, which is great for paddle boarding, boating, water skiing, and tubing. Adventure seekers can go cliff-diving off Pulpit Rock or try out the waterski slalom course located next to the lake's main island, while anyone looking for a more leisurely experience can enjoy a cruise around the lake on one of the tour boats. There are three marinas on the lake as well as a free boat launch. Lake Superior State Park is home to the tiny Lake Superior in Sullivan County, not to be confused with the Great Lake of the same name. A swimming beach is open every day during the summer months, and the park also offers picnic areas with tables, volleyball courts, a food concession. The lake is also great for fishing; several boat launches are available, but gas-powered boats are not allowed on the lake. Boat rentals are available. 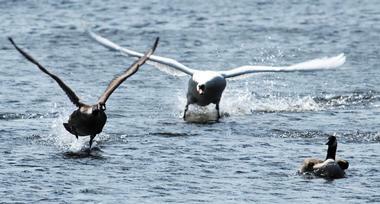 Big game hunting is permitted for people with a valid hunting license, and ice fishing is popular during the winter. 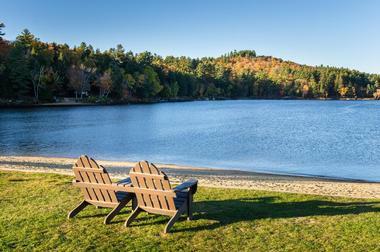 Located right next to the much larger Lake Placid, Mirror Lake is known for its clear waters and serene atmosphere. A 2.7-mile brick walking trail encircles the lake; the pathway features plaques naming each of the 46 Adirondack High Peaks. 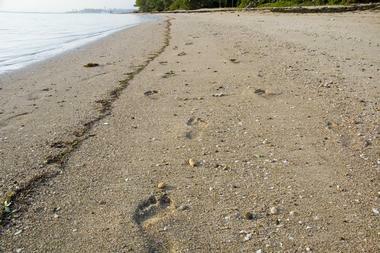 The trail starts and ends at the public beach, which offers a swimming area, tennis courts, and a children's playground. Motorized boats are not permitted on the lake, but visitors are free to paddle boat, canoe, or kayak. During the winter, the lake is used for ice skating, dog sledding, and sledding down the thrilling Lake Placid toboggan chute. The largest lake located entirely within the state of New York, Oneida Lake is approximately 21 miles long and 5 miles wide. The lake is relatively shallow and gets quite warm during the summer months, making it an excellent destination for swimming, boating, and other watersports. There are also plenty of walleye and bass to be found here, and people come to fish throughout the year. One of the most popular spots on the lake is Sylvan Beach, which offers plenty of restaurants, bars, and shops as well as an amusement park that provides nighttime ghost tours. Seneca Lake is remarkable for two reasons: It's the largest of the Finger Lakes, and it's the deepest lake in the state of New York. It's also known as the "Lake Trout Capital of the World," and it hosts the National Lake Trout Derby at the beginning of every summer. However, the lake has plenty to do even if you're not interested in fishing, including boating, swimming, and cycling along the 77-mile Seneca Lake Loop. The area is also a highly regarded winemaking region, and more than 30 wineries are located along the shores of the lake. 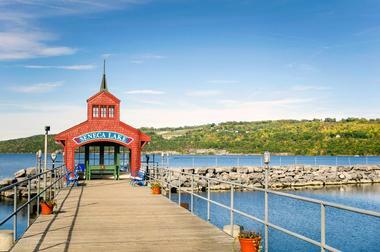 Despite its difficult-to-pronounce name, Skaneateles Lake is one of the most beautiful and serene Finger Lakes. Nestled between forested ridges, the lake is known for its incredibly pure blue-green water, which the nearby towns use as a source of unfiltered drinking water. There is a 32-mile circular road around the lake that is popular with cyclists, and visitors also flock to the lake to sail, boat, swim, kayak, and fish. A worthwhile destination on the shore is the little village of Skaneateles, which offers plenty of restaurants and hotels as well as a quaint, charming atmosphere. Formerly the summer residence of television star Elizabeth Montgomery, Wonder Lake State Park is a 1,133-acre park that is home to the 3-acre Laurel Pond as well as to the beautiful Wonder Lake. 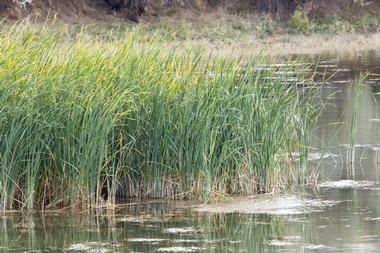 The park is a popular hunting destination, while the lake is a great place to fish. There are 8.6 miles of marked trails for visitors to enjoy here, including portions of both the Appalachian Trail and the Highlands Trail. The park is also home to a bird conservation area and to the sandy Canopus Beach, which offers to opportunity to swim, boat, and picnic.